Recently I wrote about the importance of reading to children in the post Foundations in Literacy Learning. Yes, reading everyday to even the littlest of little ones is crucial to building the foundation of their future learning. Now I’m going to help you build your baby’s library. The public library is a wonderful resource, but I love having a collection of great books my boy can both figuratively and literally sink his teeth into! I suggest looking for a variety of books so I’ve outlined some different kinds of children’s books for you. 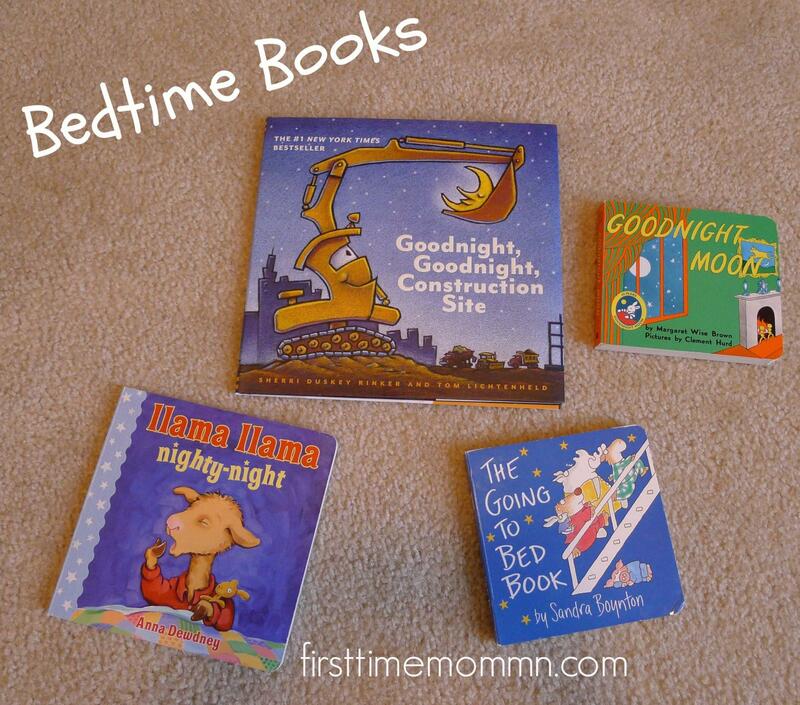 Bedtime Books: Reading stories before bed is a time-honored tradition so having some books centered on the theme of saying goodnight is a must in any child’s personal library. Bedtime books seem to magically wind down my busy boy. Even if we only get through a few pages we always read before naps and bedtime. Some of our bedtime favorites include: Goodnight Moon by Margaret Wise Brown (simply a classic), The Going-To-Bed Book by Sandra Boynton (a short and silly lilting rhyme), Lama Lama Nighty Night by Anna Dewdney (a quick look at big kids getting ready for bed), and Goodnight, Goodnight, Construction Site by Sherri Duskey Rinker and Tom Lichtenheld (a rhyming farewell to the sleepy construction machines). Interactive Books: Naturally reading stories is an important part of our bedtime/nap time routine; however, books are also great for play. Interactive books have tactile components that young children engage with like different textures, mirrors, fun tabs, etc. When looking for interactive books keep in mind your child’s age as some books are more sturdy than others. At thirteen months BabyCakes just started getting the hang of touch & feel books. On the other hand, my 3 year old niece loves looking at the touch & feel books all by herself. For babies just starting to practice a pincher grip I particularly like DK Publishing’s “lift-the-flap” board books, they are sturdy and easy for baby to flip through. 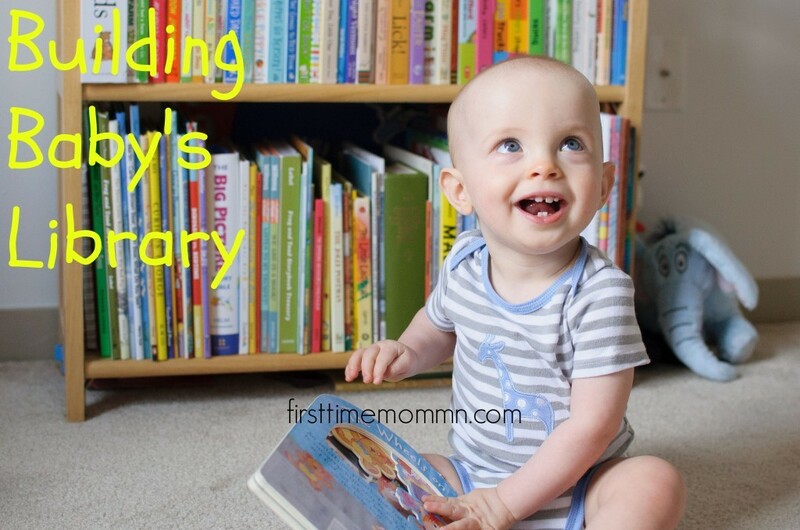 Great Stories: When looking to build your baby’s library try to find stories you enjoy reading and books that will grow with your little one. A great story is so refreshing to both babies and adults. My brainy PhD husband, loves the Frog and Toad stories by Arnold Lobel. During the newborn days especially I found refuge in reading classic stories to our boy. Indeed, don’t limit your children’s library to “baby books,” look for great stories too! If you worry about pages getting ripped don’t forget my “fidget book” tip from the Foundations in Literacy Learning post. Singing Picture Books: Being a music educator, singing picture books hold a very special place in our library. These books illustrate children’s songs, making it easy for any care givers to have “music time” any time. Multiple studies have shown that music, especially music-making, greatly benefits brain development and fosters brain plasticity. You’ll be working your own brain while enriching your child’s day! Besides, I would argue that music is simply good for the soul and touches a part of our humanity that nothing else can. Yes mamas, even if you don’t think you can sing (which I highly doubt) SING TO YOUR KIDS ALL THE TIME! 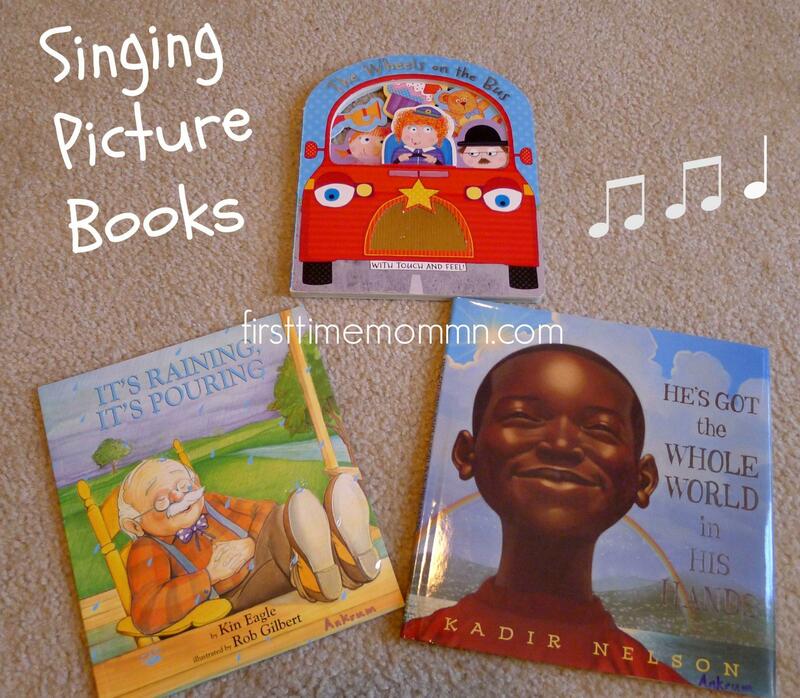 Sweet Meter and Rhyme: You may be asking yourself, how are these books different from “singing picture books?” Well friends, “sweet meter and rhyme” books have a catchy lilt to them and delightful rhymes but they do not have a specific tune that accompanies the words. These are the books that just dance off your tongue when read aloud. Any Dr. Seuss book would fall in this category. Here are some of my favorites: Jazz Baby by Lisa Wheeler, Barnyard Dance! by Sandra Boynton, Slinky Malinki by Lynley Dodd, and What the Ladybird Heard by Julia Donaldson. Good for the Heart: Bless them but sometimes babies wear out their mamas… can I get an amen! After a hard day of parenting I always reach for an encouraging story, one that reminds me of how dearly I love my precious little terror, um I mean my precious little boy. Some of my favorites are: Guess How Much I Love You by Sam McBratney, Runaway Bunny by Margaret Wise Brown, The Kissing Hand by Audrey Penn, I Love You Little One by Nancy Tafuri, Hug Time by Patrick McDonnell, and Huggy Kissy by Leslie Particelli. Books, books, wonderful books! There is a perfect book for any age, any stage, any time, any place so pack your baby’s library and life full of books! Wife, work at home mom, and bassoonist, Laura Ankrum lives in Iowa City, Iowa. Prior to the arrival of her two children Laura taught elementary music and band in the Boston area. Now her home is her classroom and music studio. Laura is passionate about education, encouraging other moms, and eco-friendly living. She is the social media coordinator at Thirsties Inc. Hubs and I are big readers and we hope our LO (arriving in June!) will inherit this from us too. We were planning on raiding my parent’s house for all my old childrens’ books soon. One of my favorites that I plan on reading to our baby is Father Foxes Penny Rhymes and Beatrix Potter.